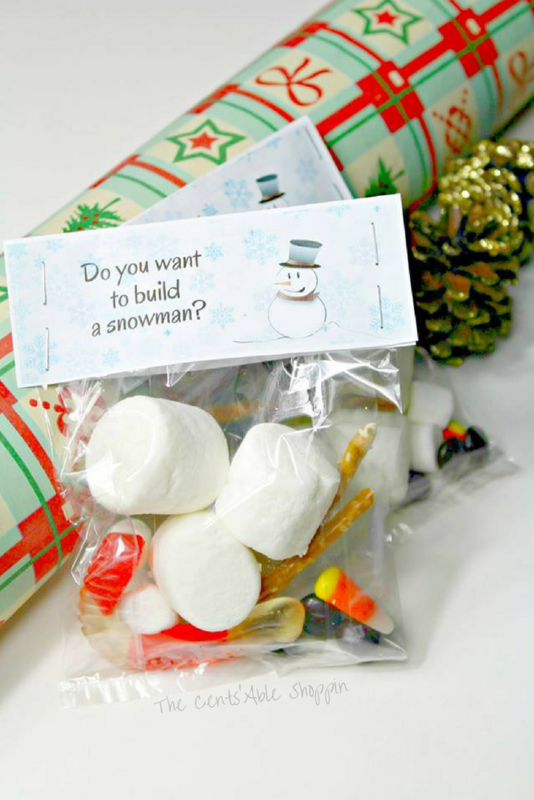 These Build a Snowman Children’s Holiday Treat Bags are an adorable way to help kids get in the spirit of the holiday season. Assembled with just a few simple items, they would be a wonderful idea for classrooms, youth groups & more! Your kids will jump at the opportunity to build a snowman – from the comfort of the classroom or in your pajamas, while sipping hot cocoa and watching our favorite Christmas movies. Face it: who doesn’t love to build a snowman??! As a young kid who grew up in Minnesota, I remember many days of missed school due to snow, the late bus, and the opportunity to throw on our snow pants and run outside to dig out all of the snow and make forts in the piles in our ditches right off our desolate country road. Over 25 years later, I miss that snow more and more every year – although I love our modest Phoenix temps, sometimes I admit that I get envious of my friends and family back up north that have a beautiful blanket of snow outside their window throughout the winter months. 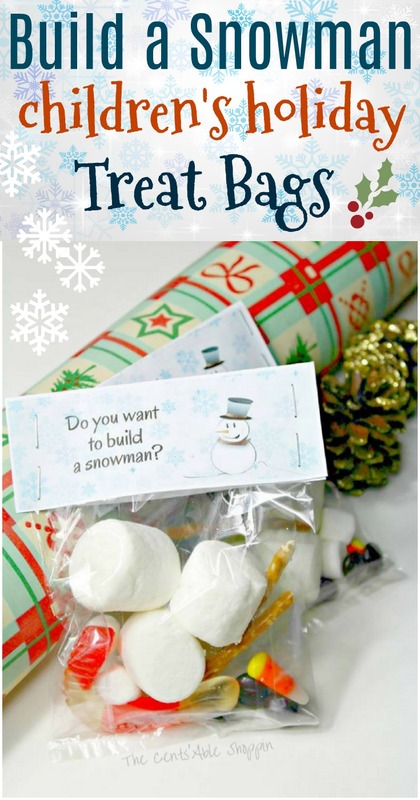 Thankfully making a snowman doesn’t always require us to put on snow pants and wait for the snow to fall – this cute Build a Snowman Children’s Holiday Treat Bag is the perfect gift to give smaller kids – perhaps a church youth group, classroom or even daycare. Or, it could very well be a fun activity for your kids to do for their own friends and family. The treat bags are so incredibly easy to make and throw together – you can make a few dozen very inexpensively. Find all of the materials at your local Dollar Tree or dollar store. You’ll also want to have a stapler handy to staple the label to each bag. Print out the printable treat bag label in color – you can use paper, or a thicker card stock (your choice). Each page will print two labels. 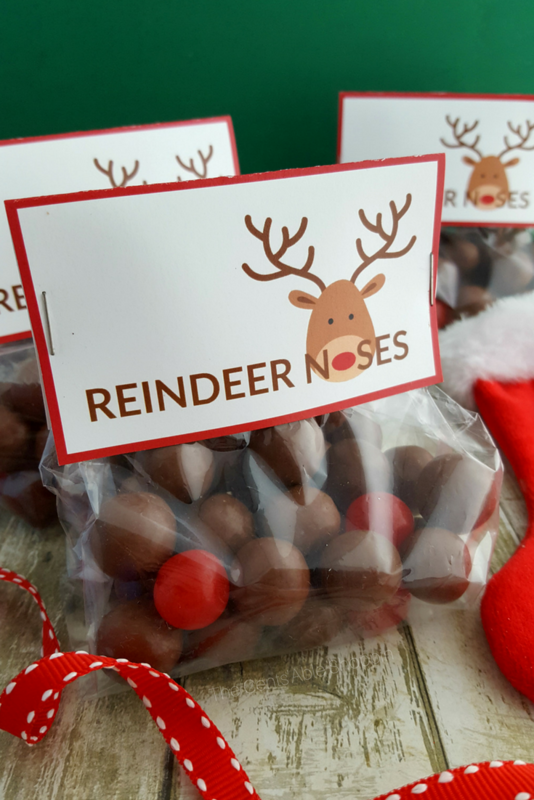 Fold the printable label in half, and staple on the sides over the treat bag, being careful to include the cello as you staple so that the snowman pieces stay inside the bag. That’s it! These bags are adorably cute! They are a great way to celebrate the season, and foster a child’s imagination – when they are done creating their snowman, they can enjoy the treats.